1st level : You can go your way on red and black slopes but are unconfortable with fresh snow. That's a pity. A course would settle this..
2nd level : You are having fun on the non-groomed sides of slopes. It is time to think about an easy off-piste itinerary for the beauty of virgin scenes. With an instructor or a guide you will experience incredible emotions with a maximum level of security. 3nd level : You now appreciate as you should the pleasure of riding far away from groomed slopes. A Professional will be able to suggest the site in accordance to your wishes, depending on the status of snow. Cancelation and reimbursment : contact us 48h in advance. 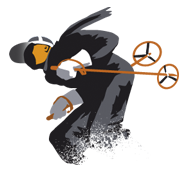 PRIVILEGE SKI SCHOOL, based at Arcs 1800, has at your disposal high level courses, both for beginners or experienced skiers. The diversity of our courses allows you to both to try a new activity or to reinforce your level in your preferred one. The ski school is located in the premisses of shops that both sells and hire equipment. The ideal place to start from !